Mexico’s Lake Chapala has attracted a thriving North American expat community, thanks largely to its idyllic year-round weather. Not surprisingly, it boasts a number of first-rate Bed and Breakfasts — among the most popular of which is Ajijic’s Adobe Walls Inn. Ir is easy to see why the lovely village of Ajijic, on the shores of Mexico’s largest inland lake, draws the lion’s share of Ribera Chapala visitors: the town’s brightly-painted buildings, cobblestone streets, and ubiquitous brilliant flowers do not fail to enchant. In the midst of it all, just a few short blocks from the main plaza, is Adobe Walls Inn, an atmospheric Spanish-style hacienda furnished throughout with Mexican antiques. 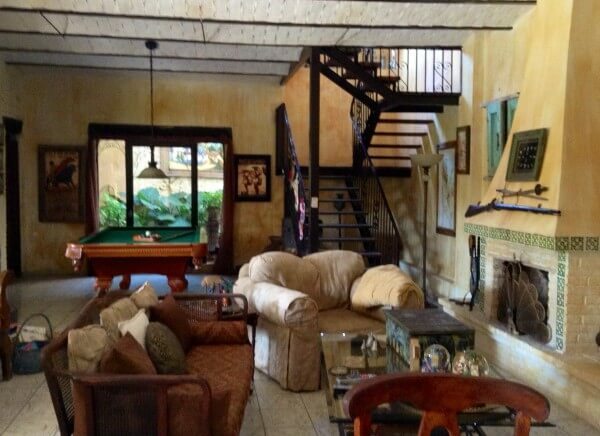 Welcoming owners Kimberly and Don, who hail from the United States, traveled much of the world before settling in Ajijic and purchasing a neglected hacienda from the direct descendants of Spanish aristocrats, whose portraits still hang on the walls. The 500-year history of the family, distilled into a framed Legend of Adobe Walls, makes for fascinating (and not lengthy) reading. 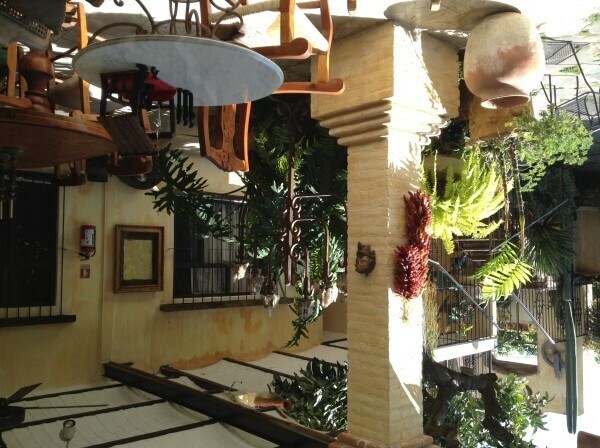 The current inn’s seven guest rooms — five doubles and two singles — are situated on two levels of the hacienda around a central courtyard. Indoor and outdoor common spaces abound, including a billiards room, library, and both sunset and sunrise terraces, perfect for reading and relaxing, in warming sunshine or cooling shade. The interiors of the rooms, decorated in soothing neutral tones, blend the old and new, as Mexican antiques and venerable wooden wardrobes co-exist with flat-screen satellite TV’s featuring American and Canadian programming. Colorful paintings and posters from Mexico’s cultural history adorn the walls, while copper-style sinks and countertops add a touch of class to the modernized bathrooms. Free wi-fi extends from the common areas to all the guest rooms; and while the latter do not have phones, guests may use the phone at the desk to make free calls not only locally — but to anywhere in the US and Canada! Adobe Walls Inn serves breakfast treats alternating between American and Mexican cuisine, from omelettes or eggs cooked any way you like, to chilaquiles or burritos. Daily accompaniments include fresh seasonal fruit, yogurt, juice, and coffee. For lunch and dinner, many terrific Mexican and international cafes and restaurants are just steps away. In addition to the torta stalls and taco stands that still abound, the burgeoning expat retirement community has made its mark with trendy restaurants and plenty of delis, as well as art galleries and boutique shops. Waterside dining along the lake’s promenade is also walking distance from the inn. Text and photos by Buzzy Gordon, who was a guest of Adobe Walls Inn for purposes of review.